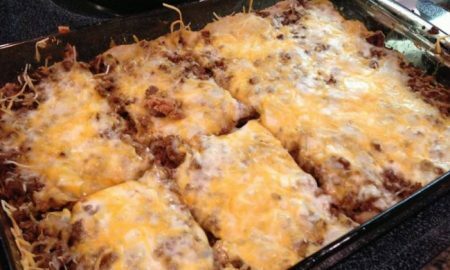 In a large skillet, cook the ground beef and onion until the beef is no longer pink and drain. Add the taco seasoning and refried beans and heat through. In a separate bowl, blend the mushroom soup with the sour cream. Then spread half of the soup mixture in the bottom of a baking dish. Add a layer of 3 flour tortillas to the top of the soup mixture. You will need to cut or tear the tortillas and overlap them. Spread on a layer of the ground beef mixture and top with about a cup of cheese. Repeat all of these layers and top with the remaining cheese. Bake for about 20 minutes until cheese is nicely melted. Enjoy! EASY Delicious Crock-Pot BBQ Ribs Recipe!